How do I view and complete homework assigned to me? 1. Log into your account using https://portals.lab-aids.com or lab-aids.com > Book Login > New Login. If you don't know your username or password, please contact your teacher. If your school has decided to integrate with Google Classroom or with your LMS (Schoology, Canvas, etc. ), you will log in to your Lab-Aids portal via Google Classroom or your LMS. If you are unsure of where to log in, please see your teacher. 2. You will see the "Assigned Homework" menu showing on the left side. This menu displays any homework assignments that have been assigned to you, but have not yet been completed. If you don't see the "Homework" menu on the left, then just click the "Homework" icon on the top menu bar. Click on the homework assignment you see on the left menu. 3. Complete and submit the homework assignment. 1) Type your answers in the text box. Make sure you click "submit". 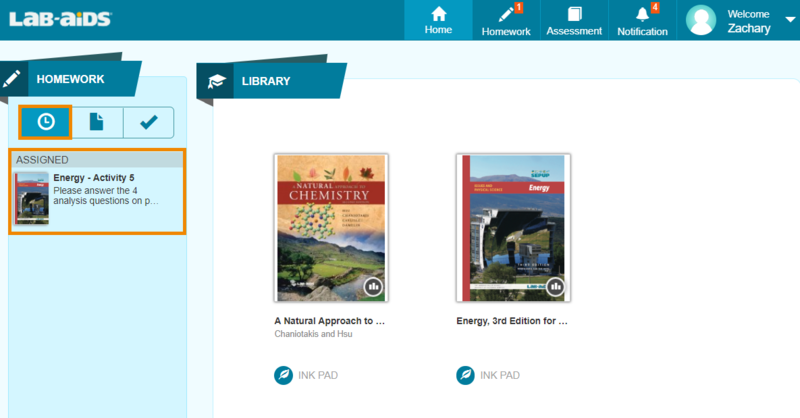 Submitted Homework: Click on the "Homework" icon on the top menu, if you haven't already. Then, in the left menu, click on the middle icon that looks like a piece of paper. Then, you will see homework that has been submitted but not yet evaluated. 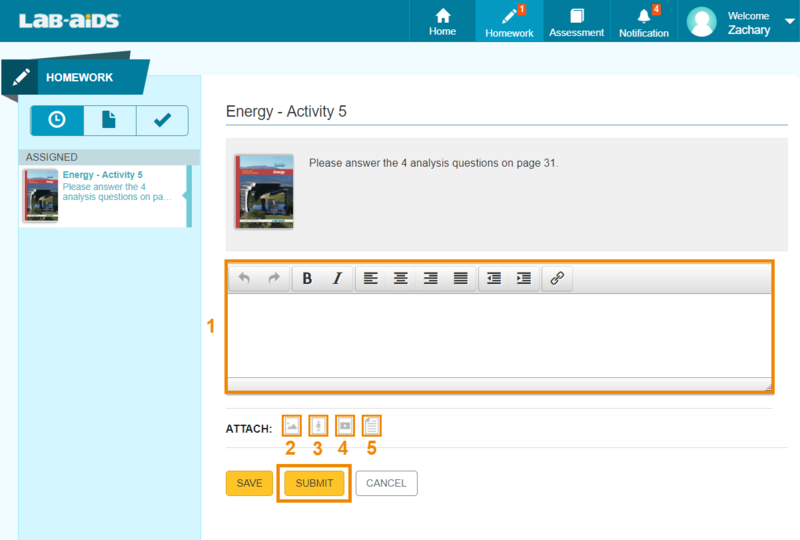 Completed homework: Click on the "Homework" icon on the top menu, if you haven't already. Then, in the left menu, click on the right checkmark icon. Then, you will see homework that has been evaluated by your teacher. If you don't see anything under the "Assigned Homework" clock icon on the left homework menu, that means you either haven't been assigned homework, or you have already completed it. If you don't see the homework menu on the left side, click on the "Homework" icon on the top menu to return back to the homework menu.